Quite a few eyebrows were raised when master drag-flicker Chris Ciriello who the Indians once dreaded, decided to switch camps earlier this year. The Australian defender whose grandfather had migrated Down Under after playing for India chose to return to his ancestral land to assist the Indian players to overcome their weaknesses. Many wondered if our very own specialists would start firing PC hattricks just as the Aussie champ often did. A dry pitch at Breda meant that most teams were unable to get their pushes in as smoothly as they would have wanted to and the conversion percentage for PCs hit an abysmal low. Chris himself was infuriated and decided to take the matter up at the highest level with the organizers of the Champions Trophy. "I came out straight away and told them it was ridiculous because when you have a PC it's effectively a free shot on goal." Yet, both Sjoerd Marijne and Harendra Singh were emphatic that Ciriello was not roped in only for his drag-flicking skills. The 32-year-old, they reasoned, had a lot to offer by way of strengthening India's defence, and more importantly, for molding the team into a world-beating unit with his big-match expertise which included gold medal-winning performances at the Olympics, World Cup, and Champions Trophy. The Indians defended grittily at Breda against the best teams in the world and perhaps better than ever before in conscious memory. "Tyler Lovell was the player of the final"
Beating Australia in a big final has been an elusive dream for every Indian hockey fan and many hoped that an Aussie in the Indian camp could perhaps achieve the near-impossible feat. Who else, but Ciriello would know better what it takes to beat the invincible kookaburras. "Australia is almost back to full strength but it is all about putting pressure on them. In the second half (of the CT final), we could have won by quite a few goals because of the stress and pressure we put on them. Aussie Assistant Coach Robert Hammond who I played with for a long time asked me if they had ever played that bad." "We had plenty of shots, plenty of momentum, and their goalkeeper Tyler Lovell who used to be my roommate was by far the player of the final. He saved some near-certain goals. He had conceded three PC goals against Argentina and had not played well against them, but in the final, he did." "Under pressure is when you stand out. It is easy to be able to score goals when you are already 2-0 or 3-0 up but it is the one goal you have to fight for when you are down." Chris feels the Indians could and should have won the final but the loss will push them to work even harder. He has been following the Women's World Cup at London closely and hopes his friends Rachel Lynch and coach Paul Gaudoin can inspire the Hockeyroos. The Golden Girls, he says, have performed admirably in their World Cup, thanks to Harendra Singh and Sjoerd Marijne, and the Indian men too can compete with any side in the world. 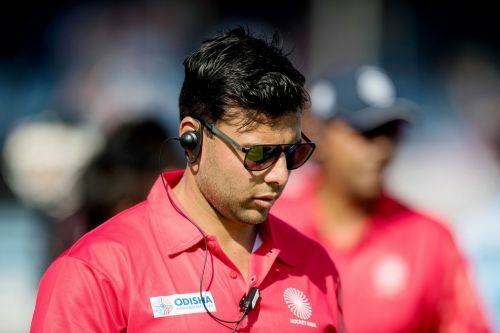 In an exclusive chat with Sportskeeda, India's Analytical Coach analyzes his team's performance at the Champions Trophy like only he can, and looks ahead to the Asian Games and the World Cup. "We did not win silver ... we lost Gold at Breda"
SK: The Indians won silver at Breda after a creditable performance. Are you satisfied? Ciriello: The experience was good. It was a good learning curve because this tournament is not like the other tournaments we have played previously although they were okay. This is a knockout tournament, so if you don't win and perform every game then you don't make the final. In the HWL, India did not win three games, and then progressively won one or two games, but this time, the guys were consistent. Coming to the final, we should have won. They got a PC - we should have referred - one guy did go for it but in the end, the team did not. Sreejesh should have saved it. We had a good opportunity to win. For the belief in the team, and the guys it was really good. For me, we lost a gold medal in the Champions Trophy. You do not win a silver - you lose a gold. Also, maybe it is good we did not win because it is a learning curve to know that we can compete with every team in the world and hopefully that pushes us further. "Umpiring directors accepted that the referee was wrong in awarding PC to Belgium"
SK: Do you feel we could have beaten Belgium? How do you think we matched up? Ciriello: We had equal or more opportunities against Belgium. The one that Belgium scored from, we actually referred. I sat with the umpiring directors all through and asked them to explain the decision based on the footage and they came back to me and said that they were wrong. That is the PC they scored from. If we had beaten Belgium, the match against the Dutch would not have mattered much. Belgium is always a tough team. They are physical and strong and have their different qualities. It was a tough game, and a good one too. They had beaten us thrice (in the Four-Nations in New Zealand) earlier in the year. They are probably the most experienced team in the world with an average of around 150 caps. We should have won that game but our guys defended well enough to ensure that they could not score a second. SK: We won back-to-back matches against Pakistan and Argentina. Would you say the fitness of the boys is now much better than before? Ciriello: In the first game, we actually lost Ramandeep, and he was the best striker in the team, and I think all the guys in the team and the coach would agree with that. So, the guys had to play another 5-6 games a man down which means that each player has to play more minutes and do more running- high intensity running and everything else has to be high too. So, that was difficult for the guys but we wanted to prove that we could still compete. We did well but there are a lot of areas we can still improve. "The Indians did not struggle at Gold Coast"
SK: The Indians seemed to be struggling in the CWG. In the CT, they were quite brilliant. How did the sudden transition happen? Ciriello: I do not agree with that. We did not struggle at CWG if only you look at all the stats, without looking at the overall result, and everything that has had happened in the course of the game. We had nearly 30 circle entries in every game. So, a big focus for me is what we do when we get into the circle. In the Champions Trophy, we had less than half that many circle entries - not even 15 in some games. At Breda, we had lesser opportunities, but the finishing was better. Also, our tackling and the defensive work was better in the Champions Trophy. Obviously, I and Harry (Harendra Singh) both being defenders have been able to manage that. It is all about finishing really, and in the Champions Trophy we finished better and we defended well. We should still be finishing even better. Against New Zealand in the last game, we had 32 circle penetrations, 9 shots on goal and 9 PCs. "It was my idea to introduce a can of water to water the pitch"
SK: Most teams were unable to get the pushes right during the PC routine. What exactly was happening? Ciriello: Over there, they had an issue with the watering system. So, they could either water pitch 1 or pitch 2. So, we had 8 or 9 short corners across the tournament where we could not push. So, it was my idea to introduce a can of water and that happened because of me. I went to the tournament director and explained that the quality of the field for an international tournament was not acceptable and they accepted that. I sat with the guys who plan and organize all the fields and the watering system and everything else and was assured that the tournament director and the organizing committee would have that sorted better. It cost us quite a few opportunities to have a free shot on goal. It also affected us more because we played when it was hotter. The tournament director is a good friend of mine and he told me it would be better by the second week and I said it cannot be fine. He asked me why and I told him that since the temperature, as per the forecast was going to increase from 23 degrees to 30 degrees, there was no way the pitch could get better. So, that is why the watering cans were used. So, if you see the stats, in spite of the fact that we could not manage to get the pushes right, we still managed just over 20% (conversions) which was second only to Argentina who were at 25%. If you add the ones we couldn't push, it would get closer to 30%. Of course, we also need to learn to push and trap on any kind of field. "Although Pakistan is not in the top ten, they are easily a top-ten team"
SK: Do you feel the Asian Games will be easy now that we have faced stiffer competition at the world level? Ciriello: There is no such thing as easy. In the Women's World Cup, we have seen that teams can score one goal and then retreat and sit tight and put every player in defense. Although Pakistan is not in the top ten, are easily a top-ten team. With Roelant there, they are getting better and stronger. They beat Argentina in the Champions Trophy didn't they? Pakistan is a good team but has not played many games of late. So, they do not have enough quality and are not fit enough yet. They did make it tough for us for around 45 minutes. They will get better at the Asian Games as it is an important tournament for them too. Also, India-Pakistan matches are always intense because of the rivalry. Korea has really good drag-flickers. They can score from two corners and then sit back in their own circle. At the start of the tournament, anyone has a chance to win. We cannot take anything for granted. India A played against Bangladesh and won 5 games. Against Korea, there were some guys who filled in and played as well and we had 3 wins and 2 draws. The Asian Games team played New Zealand and we made it quite difficult for them but I do not think they had enough of their top players and a few guys were injured. We are in a reasonable frame of mind. We conduct lots of meetings. At 8 o'clock every night, we go through videos from matches and training sessions.